As a business owner, cash flow can be one of your biggest challenges. You have payroll, order inventory and bills to pay. While the typical funding timeframe is 1-3 days, your business needs that money faster. What if you had better funding options to keep cash flowing and your business growing? The 1-3 day wait time is reduced by tying your batch deposits** to a debit card that is automatically loaded with your funds—within hours, not days—and even on busy weekends and holidays. 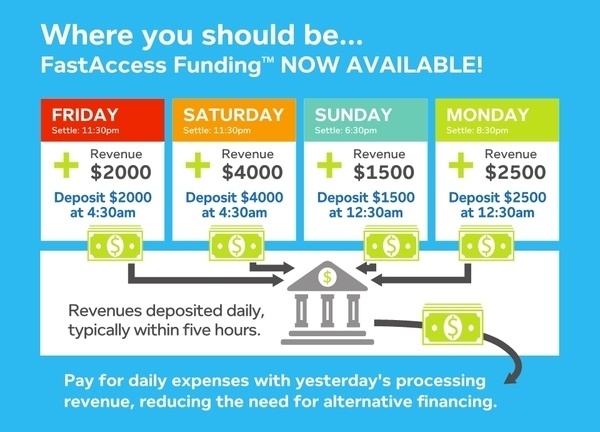 With FastAccess Funding, payouts will hit your account sooner than traditional processors. Feel confident about the funds you have available with a more consistent checking account balance. Use your debit card account to receive funds within a few hours. After you're approved with an eligible debit card, deposits can be delivered to your bank account 7 days a week, 365 days a year. Ensure funds are on hand to pay vendors and make payroll on time, every time. You deserve to spend your money the way you want. And, with FastAccess Funding, you can stop worrying about cash flow and focus on what matters most—growing your business. *Certain limitations, terms and conditions apply. Merchant must sign addendum agreement to qualify. **Deposits capped at $15,000 per deposit window.